Make sure that everybody shows up on time to your event by setting the date and time. To choose a date and time for your event, click the date and time boxes, and select when your event starts and ends. Check Repeat and enter the details for how you want to schedule your recurring events. If you have a lot of guests, you can quickly see when everyone is available. Click Suggested times under your guest list to see a list of times when everyone can attend. 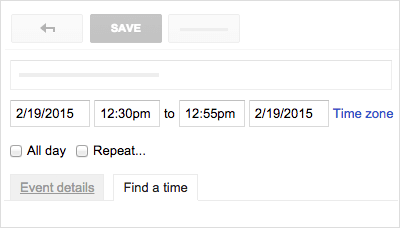 Or, click the Find a time tab to stack your guests’ calendars, then pick a time when nobody has a scheduling conflict.